When cancer comes to mind, not many people think about their feet. But acral lentiginous melanoma — commonly known as ALM — is a serious type of skin cancer that affects that very body part as well as the hands and nails. Here’s everything you need to know about the potentially deadly cancer. Acral lentiginous melanoma affects hairless surfaces of the body, including the soles of the feet, palms of the hands, mucous membranes and under the fingernails and toenails. However, over 78% of cases appear on the feet. Headed To The Pool? Read This First! Contrary to popular belief, acral lentiginous melanoma is one of the few skin cancers that is not attributed to sun exposure. Scientists don’t know exactly what causes the melanoma to form, but UV rays have officially been ruled out. Acral lentiginous melanoma rarely affects light skinned people. However, it is one of the most common subtypes of melanoma in Asians and people with dark skin. In fact, it accounts for up to 72% of melanoma cases in dark-skinned patients and less than 1% of Caucasian patients. ALM is one of the most rare cancers (it only accounts for about 2% of all melanoma cases), but nearly one-third of all skin cancers diagnosed in dark skinned people end up being ALM. The two places that experience the most reported cases of acral letiginous melanoma are Australia and New Zealand. However, as previously mentioned, sun exposure is not a cause of ALM. While people of all ages can develop acral lentiginous melanoma, the most common time to develop the cancer is between the ages of sixty and seventy. Nearly all cases are in patients over the age of the 40. ALM typically appears in one of two ways: either as longitudinal tan, black or brown streaks on a toenail or fingernail (often on the big toe or thumb), or as irregularly shaped dark pigmentation on the soles of the feet or palms of the hands. Sometimes the toenails or fingernails begin to lift from the nail bed and resemble a chronic nail infection. When ALM affects the mucus membranes, nosebleeds and a stuffy nose are common symptoms. Many people don't seek treatment for these signs and symptoms, as they assume the skin discoloration and/or nail lines are the result of an injury. If you develop irregular pigmentation or moles on your hands or feet or abnormal streaks on your toenails or fingernails, it’s important to visit a doctor so you can rule out the possibility of ALM. Typically, moles and pigmentation caused by acral lentiginous melanoma follow the rules of ABCDE: They aren’t Asymmetrical, they have Border irregularity, they exhibit Color variation, have a Diameter that’s at least the size of a pencil eraser and they Evolve in shape, size and color. ALM moles can remain on the epidermis for years before they cross the dermis and spread to other parts of the body. However, it’s important that anyone who experiences an irregular mole on their feet or hands visit a doctor as soon as the mole develops, as the surface of the legion may remain flat and unchanged while the tumor grows deep into the skin. Furthermore, survival rates are closely related to the thickness of the tumor at the time of diagnoses. The thicker and more advanced the tumor, the less likely a patient will successfully battle the cancer. If a doctor takes a biopsy or dermoscopy and determines you have ALM, he or she will recommend treatment based on the severity of the cancer. Treatment options include excision of the cancer, chemotherapy, lymphangiogram with lymph node dissection, and/or amputation. A US study found that ALM had a 5 and 10-year melanoma-specific survival rate of 80.3% and 67.5%, respectively. 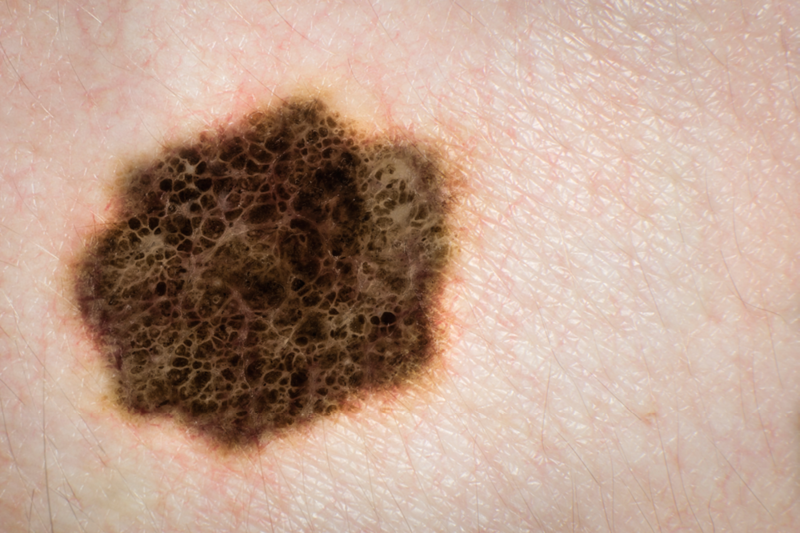 The rates are much lower than the rates for melanoma overall, which are 91.3% and 87.5%, respectively. ALM affects both women and men in equal rates, but women are more likely to survive a diagnosis. Studies show this may be due to the fact that women are more likely to seek medical treatment early on. Hispanic whites and Asian/Pacific Islanders have the worst survival rates of ALM, most likely because they generally wait the longest before seeking medical attention for the cancer.